A lightweight backpack that does not sacrifice on features. This backpack is suited for gamers on the go. Perfectly sized for the Alienware Thin & Light m laptops. 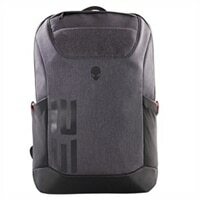 Alienware M15/M17 Pro Backpack 17" for the mobile gamerA lightweight backpack that does not sacrifice on features. This backpack is suited for gamers on the go. Perfectly sized for the Alienware Thin & Light m laptops. Durable Heathered Gray fabric with Ballistic weave base panels. Padded laptop sleeve to keep electronics safe and protected. Huge side stretch knit nylon pockets for easy storage. Valor patch ‘hook & loop’ panel to wear allegiances proudly. Heavy duty top handle to pick up and go.